So while landlubbers cling to their bamboo, the clientele next door at Did’s can surf from 12 different froyo flavors (40 cents per ounce) to shave ice ($2.25 - $2.75) or bubble tea ($2.75-$4.25); they drop into some fresh vegetable and fruit juices like the Breath Freshener — carrots, parsley, cilantro, green pepper and cucumber; or The Dude — carrot, tomato, beet, green pepper, red pepper, onion and ginger ($4.95-$6.95) all before lining up to order pizza ($1.99-$3.00/slice, $8.49-$22.99/pie) teriyaki plates ($7.99), salads ($4.49-$17.99) or calzones($8.99). The walls are embellished with shiny surfboards. Beach towel-esque wall panels are strewn with actual flip flops, a copy of Mad Magazine and other beach sundries. The rest of the décor underneath the high exposed-ductwork ceiling is metallic gray. The brick-lined pizza oven is in the shape of a tiki head with glowing red eyes and, yes, there are some areas decked in the all-important grass-fringe style. 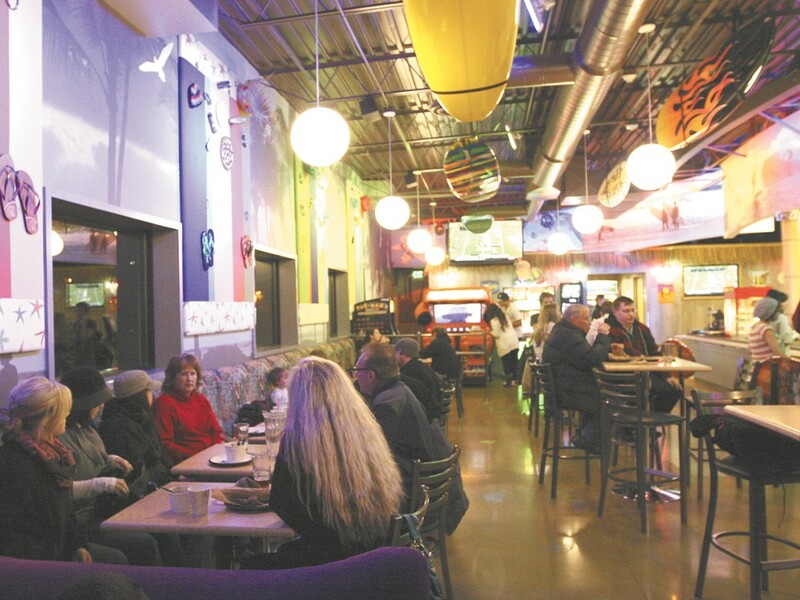 General manager Dane Rice refers to it all as a “surf shack theme.” He points out the arcade area and the 70-inch flat screen TVs while explaining that a large number of patrons are from Gonzaga and other area schools. The menu, as well as the décor, reflects that. Take, for instance, the calzone, filled with ricotta, mozzarella, mushrooms, peppers and onions. The one-foot-long wonder of golden pizza dough rises high above its plate. Stick a knife in it and the dough doesn’t sink all that much. A table full of dudes in their early 20s left with to-go boxes. Even they couldn’t finish the entire savory pastry. Adults who bring their younger children in for the arcade games and thin-crust pizza can order from Thai Bamboo’s menu. Beer and cocktails are also available. Come summer this spot near the park will be ready to quench any number of thirsts.